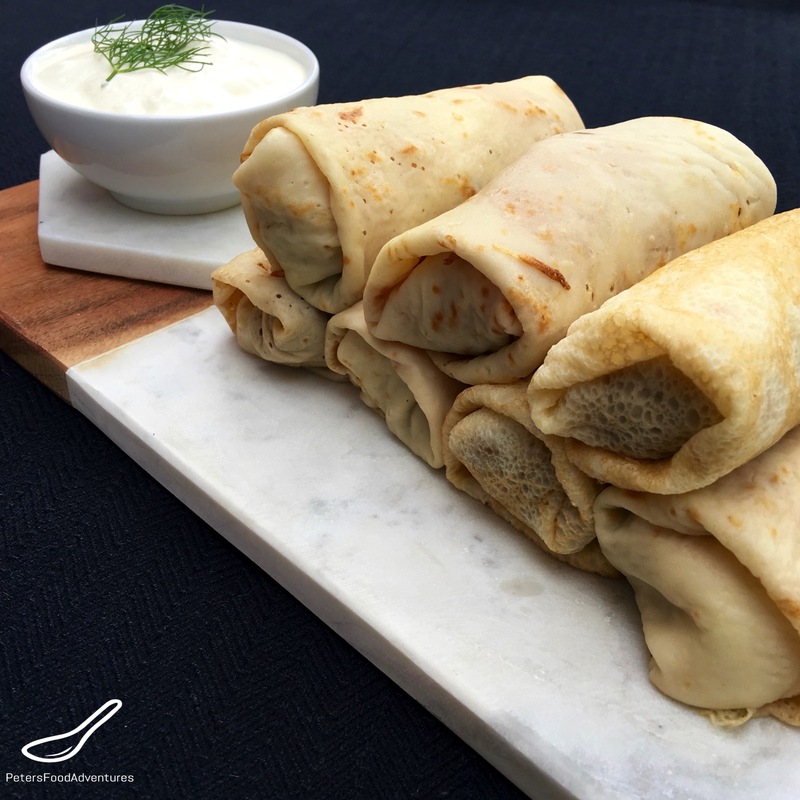 Blinchiki, Crepes, Blintzes or Blini Stuffed with Meat (Stuffed Crepes)are very common in Russia and across Eastern Europe, and are eaten at any time of day or alongside a large meal. Of course eating them plain with sour cream is a given, but stuffing them adds a whole new dimension. Blini are easy to make, check out the recipe here. They are commonly stuffed with tvorog and I have a super fast recipe to make tvorog here. You can also stuff them with fruit, but it’s more common to stuff them with meat. Any meat will work, from leftover turkey and chicken to any ground meat, such as beef, lamb, or even lamb. Traditionally, you just season the meat with salt and pepper and fried onion, but adding a bit of thick gravy makes it super flavourful and adds moisture. I didn’t add extra salt to this recipe, as the gravy adds enough salt. Some people prefer to fry the stuffed blini in a frying pan with oil, but mum always made big trays of blini that heated in the oven quickly. Blini Stuffed with Meat (Stuffed Crepes) can be easily made ahead of time, and freeze wonderfully. Bon Appetit! Приятного аппетита! Prepare blini according to instructions. Allow to cool. Saute the onions until translucent. Add the ground beef and fry until cooked. Prepare a cup of thickened beef gravy sauce and add it to the meat mixture. You can skip this non-traditional step and just season with salt and pepper, but this provides moisture and a richer flavour. Add black pepper to taste and allow to cool. This is where you would mix in the optional rice. Place one blintz on the table and put about 1-2 tablespoons of the meat mixture near the centre. It's like wrapping a burrito. Fold the bottom to cover the meat. Fold the sides in, and roll up like an eggroll or a burrito. Place the rolled blini into a oven proof dish and pat some butter on top, so it will toast golden brown. Place into a preheated 180°C/ °F oven and warm up for about 30 minutes. Serve with sour cream and fresh dill. We only ever put them in the oven to warm them up. They are already cooked. And yes, the kids love eating them!???? What a good recipe! Love these. Thanks for checking it out Alla! ??? ?